Reports of a “breakthrough” in US-Taliban talks have returned Afghanistan to the international limelight. Although both sides have reached consensus about a “framework” to deal with two key issues – a US troop withdrawal and Taliban guarantees about preventing a return of Al Qaedatype terrorist groups to the country – this still needs to be fleshed out and represents just a first step in the marathon to a peace deal. Too many details remain open, not least about the transformation of the current political system into one including the Taliban. Significantly, the Afghan government has yet to be part of these negotiations. While making progress, Zalmay Khalilzad, Washington’s new Special Representative for Afghanistan Reconciliation, must make sure that democratic, human, women’s and minority rights provided by the current constitution are transferred to the new political system. A peace deal that has no buy-in for the majority of Afghans would be worthless. There is no doubt that the Afghan government is completely dependent on external resources, thus on the US and their allies. According to various sources, the state relies on financial support for between 60 and 90 percent of its costs – more than any other country in the world. Moreover, US Special Forces and air support oftentimes make all the difference when the Taliban attacks Afghan cities. A substantial US withdrawal, if linked with a cut to most of its aid, could lead to its breakdown. This cannot be desirable for Washington. So, without Kabul’s buy-in, it is inconceivable that any deal could be implemented. Along with the US soldiers, the 38 other NATO and non-NATO countries would also leave, including the 1,300 German soldiers currently stationed there, as Minister of Defense Ursula von der Leyen told the Rheinische Post in January. 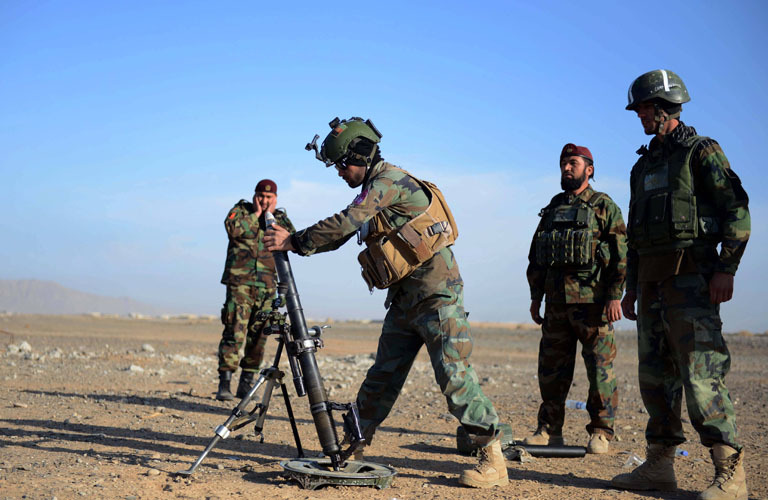 Afghan security forces are far from being able to hold the insurgency in check without outside help. US military experts say that Afghan troops need “at least another 5–10 years” of international aid and advice. 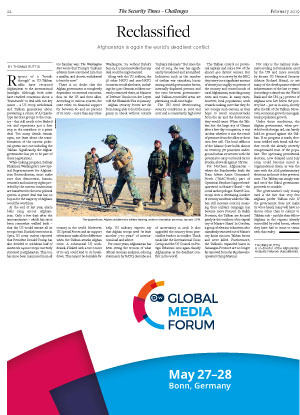 For some years, Afghanistan has been seeing the erosion of what official German analyses, echoing statements by NATO, describe as a “military stalemate.” But since the end of 2014, the war has significantly broadened and intensified. Indicators such as the number of civilian war casualties, losses among armed government forces, internally displaced persons and the ratio between governmentand Taliban-controlled areas are plateauing on all-time highs. The UN cited deteriorating security conditions in 2016 and 2017 and a consistently high level of uncertainty in 2018. It also upgraded the country from postconflict back to in-conflict. Think tanks like the International Crisis Group and the US Council on Foreign Relations now again classify Afghanistan as the deadliest conflict in the world. The Taliban control no provincial capitals and only a few of the almost 400 district centers. But according to a survey by the BBC, they carry out a significant amount of activity in roughly 70 percent of the country and control much of rural Afghanistan, encircling many cities and towns. In many cases, however, local populations work towards making sure that they do not occupy such centers, as they hope to avoid counterattacks from the air and the destruction they would cause. When the Taliban lost the large city of Ghazni after a five-day occupation, it was unclear whether it was the result of pressure from the allies or their own free will. The local offshoot of the Islamic State holds almost no territory, yet possesses underground urban structures with the potential to carry out brutal terror attacks, above all against Shi’ites. For Northern Afghanistan – where the Bundeswehr leads the Train Advise Assist Command- North (TAAC-North) part of Operation Resolute Support headquartered in Mazar-i-Sharif – the social anthropologist Kristóf Gosztonyi cites a decreasing number of security incidents while the Taliban still increase control, meaning their military campaign has become more focused. In Balkh Province, the Taliban are focused partly at the outskirts of its capital city of Mazar-i-Sharif. In October, a group of election volunteers who mistakenly ventured out of Mazar’s city limits ran into Taliban forces and were killed. Furthermore, the Taliban’s expanded bases in Samangan Province are no longer far removed from the Bundeswehroperated Camp Marmal. Not only is the military stalemate eroding (a formulation used by the UN and more recently by former US National Security Advisor Richard Haass), so are many of the development-related achievements of the last 17 years. According to data from the World Bank and the UN, 54.5 percent of Afghans now live below the poverty line – just as in 2003, shortly after the fall of the Taliban. Moreover, economic growth once again trails population growth. Under these conditions, the Afghan government, when provided with foreign aid, can barely hold its ground against the Taliban. If no progress is made, elections riddled with fraud will further erode the already severely compromised trust of the populace. The upcoming presidential election, now delayed until July 2019, could become mired in organizational chaos, as was the case with the 2018 parliamentary elections and most other previous ones. The Taliban can simply wait and see if the Kabul government proceeds to crumble. The government’s only trump card is the fact that very few Afghans prefer Taliban rule. If the government does not make its voice heard, many will have no choice other than to submit to Taliban rule – just like their fellow Afghans in the regions already controlled by rebel forces, where they have had to come to terms with this reality. is co-director of the Afghanistan Analysts Network (Kabul/Berlin).